Tyrannosaurus Rex STAN Skeleton Fossil Replica | OhGizmo! By Andrew Liszewski on 07/21/08 • Leave a comment! Museum gift shops are usually a great place to find a unique gift, particularly if you’re shopping for someone who’s interested in science or history. But why walk away with just a book about Tyrannosaurus rex when you can own a full-size fossil replica of your own? ‘STAN’, as he’s come to be known, was discovered by Stan Sacrison in the Spring of 1987, and 3 years later the Black Hills Institute of Geological Research staff spent more than 30,000 hours excavating and preparing the fossil for display. 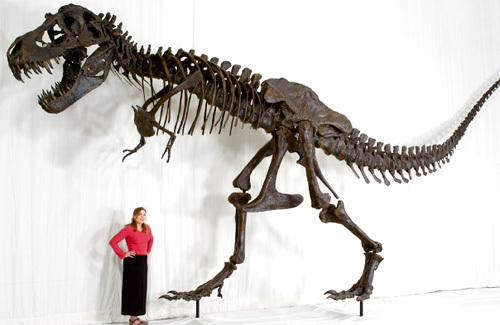 Today STAN is the most complete male Tyrannosaurus rex ever found, and is on display at the Black Hills Museum of Natural History. For just $100,000 (plus an extra $5,000 for crate construction and packaging) you can order your own STAN T. rex fossil replica. Each skeleton is constructed according to your needs including custom poses like standing, walking or running and features a steel support structure hidden within the bones. The largest section of the STAN replica is no bigger than 6 feet long and an experienced crew of six can assemble him in under an hour. Given my skills with LEGO I’m sure I could put him together in an afternoon, as long as he comes with one of those well-illustrated instruction manuals.